Denis pursued his father's policies on legislation and centralisation of power, and promulgated the nucleus of a Portuguese civil and criminal law code, protecting the lower classes from abuse and extortion. These edicts survived in the Livro da Leis e Posturas (Book of Laws and Postures), and the Ordenações Afonsinas (Afonsine Ordinances), proclaimed during the reign of Afonso V. These are not legislative "codes" as we understand them today, but rather compilations of laws and customary municipal law, as amended and restated by the Portuguese crown. Bearing in mind the many centuries that separate Denis from the present, an impression of his personality can be gathered from the historical record: he was determined, even obstinate, in his attempts to systematically centralise the government and consolidate royal power. For example, his launching of general inquiries (Inquirições gerais) at a remarkably accelerated pace to investigate land ownership and identify cases where abuses were committed. Denis revealed early on his ability as an effective strategist in the pursuit of his goals, and as an innovator of proactive legislative policy. With the benefit of a posteriori scrutiny, it is clear that his administrative decisions were not made randomly or without consideration of his ideal of a well-governed nation. The wide range of his policies is indicated by a few examples: the concomitant creation of new towns and trade fairs, the fortification of the country's borders and the increasing dependence of the military orders on the royal power. He was recognized as an intelligent, perceptive ruler with demonstrated success, both by contemporaries and by later historians. Pedro Afonso c. 1280 ? ↑ Britannica Educational Publishing (1 June 2013). Portugal and Spain. Britanncia Educational Publishing. p. 53. ISBN 978-1-61530-993-1. ↑ History of Two Queens 1. Catharine D'Aragon, 2. Anne Boleyn By William Hepworth Dixon. B. Tauchnitz. 1873. p. 49. 1 2 H. V. Livermore (2004). Portugal: A Traveller's History. Boydell Press. p. 15. ISBN 978-1-84383-063-4. ↑ Rip Cohen (1 January 1987). Thirty-two Cantigas D'amigo of Dom Dinis: Typology of a Portuguese Renunciation. Hispanic Seminary of Medieval Studies. p. 99. ISBN 978-0-942260-55-7. 1 2 Francis A. Dutra (4 December 2013). E. Michael Gerli, ed. Medieval Iberia: An Encyclopedia. Routledge. p. 285. ISBN 978-1-136-77162-0. ↑ Bailey Wallys Diffie (1977). Foundations of the Portuguese Empire, 1415-1580. U of Minnesota Press. p. 21. ISBN 978-0-8166-0782-2. ↑ John Brande Trend (1958). Portugal. Praeger. p. 103. ↑ Joseph F. O'Callaghan (15 April 2013). A History of Medieval Spain. Cornell University Press. p. 458. ISBN 978-0-8014-6871-1. ↑ Richard H. Major (1868). 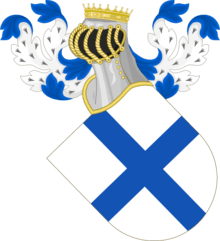 The life of Prince Henry of Portugal Surnamed the Navigator. Asher. p. 151. ↑ James Anderson (21 March 2013). Daily Life Through Trade: Buying and Selling in World History. ABC-CLIO. p. 134. ISBN 978-0-313-36325-2. ↑ Matthew Anthony Fitzsimons; Jean Bécarud (1969). The Catholic Church today: Western Europe. University of Notre Dame Press. p. 159. ↑ Helen J. Nicholson (1 January 2004). The Crusades. Greenwood Publishing Group. p. 98. ISBN 978-0-313-32685-1. ↑ William Moseley Brown; Simeon B. Chase; Paul Tice (1 April 2003). Highlights of Templar History: Includes the Knights Templar Constitution. Book Tree. p. 48. ISBN 978-1-58509-230-7. ↑ Jonathan Silveira. THE KNIGHTS TEMPLAR AND THE DISCOVERY OF THE NEW WORLD - The Evolution of Medieval Orders and the European Exploration of the Americas. Lulu.com. p. 94. ISBN 978-1-312-07814-7. ↑ Richard Mayson (12 November 2012). Port and the Douro. Infinite Ideas. p. 3. ISBN 978-1-908474-71-1. 1 2 A. H. de Oliveira Marques (1972). History of Portugal: From Lusitania to Empire ; vol. 2, From Empire to Corporate State. Columbia University Press. pp. 121–122. ISBN 978-0-231-03159-2. ↑ Cruz, Guilherme Braga da. Obras Esparsas - Volume II - Estudos de História do Direito. UC Biblioteca Geral 1. p. 263. GGKEY:NFJY2YXJ7SP. ↑ Jos. M. M. Hermans; Marc Nelissen (1 January 2005). Charters of Foundation and Early Documents of the Universities of the Coimbra Group. Leuven University Press. p. 38. ISBN 978-90-5867-474-6. ↑ Liam Matthew Brockey (15 September 2014). The Visitor: Andre Palmeiro and the Jesuits in Asia. Harvard University Press. p. 36. ISBN 978-0-674-41668-0. ↑ F. Brittain (March 2003). The Mediaeval Latin and Romance Lyric to A.D. 1300. Cambridge University Press. p. 247. ISBN 978-0-521-04328-1. ↑ Ted Gioia (5 February 2015). Love Songs: The Hidden History. Oxford University Press. p. 115. ISBN 978-0-19-935757-4. 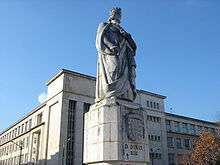 ↑ Dinis (King of Portugal); Manuel Pedro Ferreira (2005). Cantus Coronatus D'El-Rei Dom Dinis: 7 Cantigas by King Dinis of Portugal. Edition Reichenberger. p. 312. ISBN 978-3-937734-09-5. ↑ Ross W. Duffin (2000). A Performer's Guide to Medieval Music. Indiana University Press. p. 148. ISBN 0-253-21533-1. 1 2 Universidade Católica Portuguesa. Centro de Estudos de História Religiosa (2007). Carreiras Eclesiásticas no Ocidente Cristão (séc. XII-XIV). CEHR-UCP. p. 262. ISBN 978-972-8361-26-6. ↑ Salo Wittmayer Baron (1967). A Social and Religious History of the Jews: Citizen or alien conjurer. Columbia University Press. p. 406. ISBN 978-0-231-08847-3. ↑ Samuel J. Miller (1978). Portugal and Rome C. 1748-1830: An Aspect of the Catholic Enlightenment. Gregorian Biblical BookShop. p. 200. ISBN 978-88-7652-464-6. ↑ Dauril Alden (1996). The Making of an Enterprise: The Society of Jesus in Portugal, Its Empire, and Beyond, 1540-1750. Stanford University Press. p. 431. ISBN 978-0-8047-2271-1. ↑ Sheila R. Ackerlind (1990). 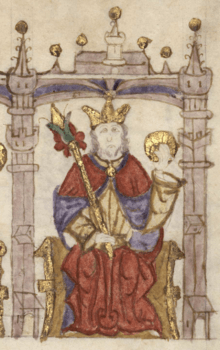 King Dinis of Portugal and the Alfonsine heritage. Peter Lang Publishing, Incorporated. pp. 10–11. ISBN 978-0-8204-0921-4. ↑ Universidade de Lisboa. Faculdade de direito (1971). Livro das leis e posturas (in Portuguese). Universidade de lisboa,faculdade de direito. ↑ O Instituto. Imprensit 2 Universidade. 1863. p. 125. ↑ Susan Canty Quinlan; Fernando Arenas. Lusosex: Gender and Sexuality in the Portuguese-Speaking World. University of Minnesota Press. p. 10. ISBN 978-1-4529-0561-7. ↑ Darlene Abreu-Ferreira, ed. (20 November 2007). Women in the Lusophone World in the Middle Ages and the Early Modern Period: Portuguese Studies Review, Vol. 13, Nos. 1 and 2 (Special Issue) (ISSN 1057-1515). Ivana Elbl. Baywolf Press. p. 77. GGKEY:DPQZALABJQ6. ↑ Antonio Henrique R. de Oliveira Marques (1971). Daily Life in Portugal in the Late Middle Ages. Univ of Wisconsin Press. p. 182. ISBN 978-0-299-05584-4. ↑ E. Bradford Burns (January 1993). A History of Brazil. Columbia University Press. p. 20. ISBN 978-0-231-07955-6. ↑ Ti Alkire; Carol Rosen (24 June 2010). Romance Languages: A Historical Introduction. Cambridge University Press. p. 333. ISBN 978-0-521-88915-5. ↑ Bailey Wallys Diffie (January 1960). Prelude to Empire: Portugal Overseas Before Henry the Navigator. U of Nebraska Press. p. 38. ISBN 0-8032-5049-5. ↑ Carlos Andrés González-Paz (28 February 2015). Women and Pilgrimage in Medieval Galicia. Ashgate Publishing, Ltd. p. 88. ISBN 978-1-4724-1070-2. ↑ Medicine and the Law in the Middle Ages. BRILL. 27 March 2014. p. 216. ISBN 978-90-04-26911-8. ↑ Carlos Andrés González-Paz (2012-05-07). Reassessing the Roles of Women as 'Makers' of Medieval Art and Architecture (2 vol. set). Brill. p. 918. ISBN 978-90-04-22832-0. ↑ James Maxwell Anderson (1 January 2000). 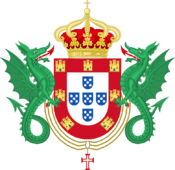 The History of Portugal. Greenwood Publishing Group. p. 33. ISBN 978-0-313-31106-2. ↑ Sanjay Subrahmanyam (30 April 2012). The Portuguese Empire in Asia, 1500-1700: A Political and Economic History. John Wiley & Sons. p. 53. ISBN 978-0-470-67291-4. ↑ H. V. Livermore. A History of Portugal. Cambridge University Press. p. 153. GGKEY:XWSD821GE8S. ↑ Louis Reichenthal Gottschalk; Loren Carey MacKinney; Earl Hampton Pritchard (1969). The Foundations of the Modern World [1300-1775]. International Commission for a History of the Scientific and Cultural Development of Mankind. p. 952. ↑ Jean-Benoit Nadeau; Julie Barlow (7 May 2013). The Story of Spanish. St. Martin's Press. p. 81. ISBN 978-1-250-02316-2. ↑ International Commission for a History of the Scientific and Cultural Development of Mankind (1963). History of Mankind: Cultural and Scientific Development. George Allen and Unwin. p. 952. ↑ Erwin Anton Gutkind (1967). International History of City Development: Urban development in southern Europe: Spain and Portugal. Free Press of Glencoe. p. 47. ↑ Isabel Lencastre (29 March 2012). Bastardos Reais Os Filhos Ilegítimos dos Reis de Portugal. Leya. p. 19. ISBN 989-555-846-5. ↑ Ana Maria S.A. Rodrigues (7 May 2012). "23". Reassessing the Roles of Women as 'Makers' of Medieval Art and Architecture (2 vol. set). 2. BRILL. p. 1069. ISBN 978-90-04-22832-0. ↑ João Ferreira (2010). Histórias rocambolescas da história de Portugal. Esfera dos Livros. ISBN 978-989-626-216-7. ↑ José Mattoso; Armindo de Sousa (1997). 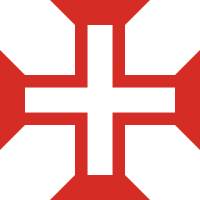 História de Portugal. 2, A monarquia feudal (1096-1480). Editorial Estampa. p. 140. ISBN 978-972-33-1263-8. ↑ John Dos Passos (2 March 2011). The Portugal Story: Three Centuries of Exploration and Discovery. Knopf Doubleday Publishing Group. p. 66. ISBN 978-0-307-78706-4. ↑ Rita Costa Gomes (10 April 2003). 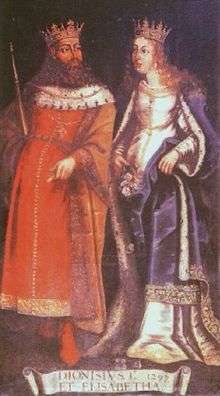 The Making of a Court Society: Kings and Nobles in Late Medieval Portugal. Cambridge University Press. p. 86. ISBN 978-0-521-80011-2. ↑ José Augusto de Sotto Mayor Pizarro (2008). D. Dinis. Temas e Debates. p. 206. ISBN 978-972-759-966-0. ↑ Catholic Encyclopedia. Appleton. 1908. p. 197. ↑ Pizarro 2008, p. 207. "Atacando e apaziguando, alternadamente, os interesses senhoriais laicos e eclesiásticos: desamortizou os bens do clero, mas aceitou a concordata e restringiu os direitos de comedoria nos mosteiros; inquiriu os bens senhoriais, mas as leis de desamortização travam a erosão dos patrimónios senhoriais." ↑ Charles William Previté-Orton (1852). The Shorter Cambridge Medieval History. 2. CUP Archive. p. 832. GGKEY:RJXLJYT61T4. ↑ Richard Lansing (11 February 2011). The Dante Encyclopedia. Routledge. p. 304. ISBN 978-1-136-84972-5. ↑ Thomas J. Craughwell (12 July 2011). Saints Preserved. Crown Publishing Group. p. 89. ISBN 978-0-307-59074-9. ↑ Duarte Nunes de Leão (1600). Primeira parte das Chronicas dos Reis de Portugal. impresso por Pedro Craesbeeck. p. 123. ↑ José Crespo (1972). Santa Isabel na doença e na morte. Coimbra Editora. pp. 113–117. ↑ Amir D. Aczel (19 February 2009). Descartes's Secret Notebook: A True Tale of Mathematics, Mysticism, and the Quest to Understand the Universe. Crown Publishing Group. p. 115. ISBN 978-0-307-49480-1. ↑ Michael Jones (1995). The New Cambridge Medieval History: Volume 6, C.1300-c.1415. Cambridge University Press. p. 634. ISBN 978-0-521-36290-0.